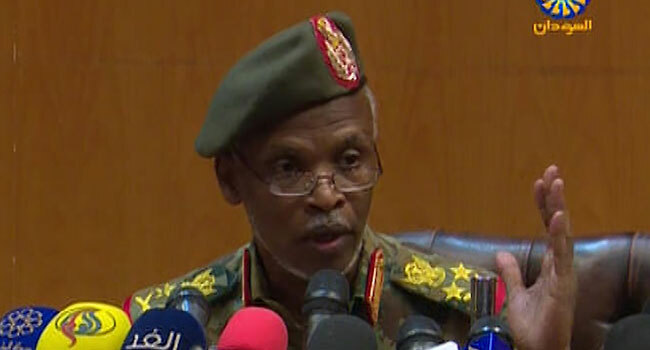 An image grab from a broadcast on Sudan TV shows Lieutenant General Omar Zain al-Abdin, the head of the new Sudanese military council’s political committee, addressing a press conference on April 12, 2019, in the capital Khartoum, one day after Sudan’s army ousted the Arab-African country’s veteran president Omar al-Bashir. Sudan’s ousted president Omar al-Bashir, who is wanted by the International Criminal Court on charges of genocide and war crimes, will not be extradited, the country’s new military rulers said Friday. “The president is currently in custody,” the head of the military council’s political committee, Lieutenant General Omar Zain al-Abdin, told a news conference. “We as a military council, we will not deliver the president abroad during our period” in office, Abdin said when asked about the ICC arrest warrant.